Japanese Honeysuckle (Lonicera japonica) Native to Japan, Taiwan, Korea and other parts of Asia, the Japanese Honeysuckle is a very popular dooryard plant in many states and can tolerate temperatures to (briefly) -10F. It is a fast growing vine to 30 feet in 4 years and has abundant, delicious smelling flowers in mi-spring in the southern states and late spring in cooler, or temperate states. Flowers are white, turning cream colored as they age and their scent is similar to jasmine. 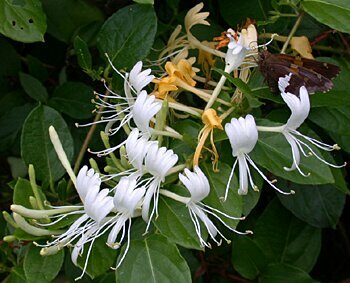 Japanese honeysuckle has medium tolerance to drought, though if grown in containers, they cannot be allowed to dry. Grown in full sun or full shade. This honeysuckle needs as much sun as possible to flower properly. It should be grown on a trellis or be allowed to cascade from large containers.